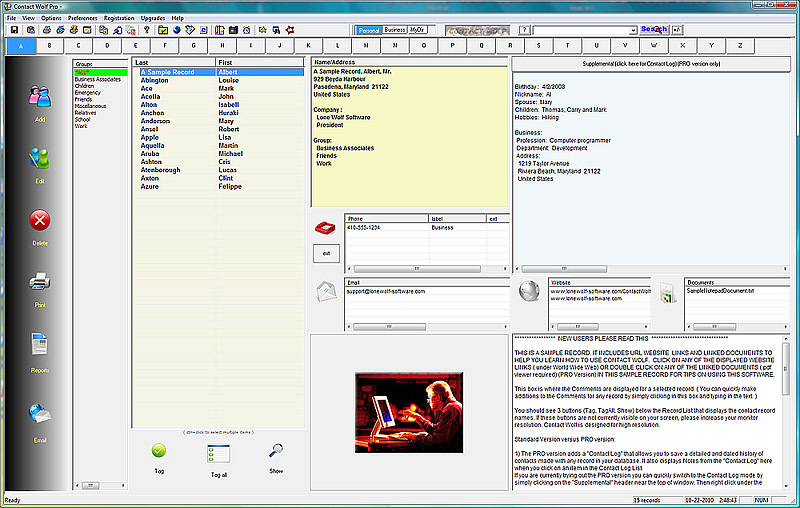 Powerful Contact Management Address Book Software for Home or Business. Join thousands of satisfied customers that use Contact Wolf every day to manage their contact information. Quality contact management software that makes it EASY to keep track of family, friends, clients, customers, businesses or anyone. Organize your contacts in categories that you create. Print labels, create email lists, print personal address phone books, maintain contact histories or remind yourself of important dates. Saves detailed information on everyone you know - Phone Address information, internet addresses, family info, business details, personal comments and more! Configure your own data fields, import old address books and easily share your contact database on a network. Create your own internet based personal phone book, bulk email thousands of recipients or view any address on a detailed map with directions. Contact Wolf's award winning design sets a new standard in Contact Management Software. An intuitively easy to use interface lets you start building your contact database without hesitation. Easily print address labels, reports or export your contact information and address book into multiple formats. Powerful enough for large businesses or any home based business and easy to use for the average home user. Easy to learn, packed with features and Network Compatible. Includes password protected record options and an Easy Access Help System. One program that will handle all of your contact management needs. Powered by a dynamic relational database engine that provides unlimited capacity and unparalleled speed. Contact Wolf Contact Management Software is licensed as Shareware and developed or distributed by Lone Wolf Software as Contact Management or Address Book software. Contact Wolf Contact Management Software is a trademark of Lone Wolf Software. FREE downloads of the 30 Day trial version are available. Support and upgrades are FREE after purchasing.